For the good of his soul, every golfer needs to play in Scotland. For the good of just about everything else, he must tee it up on Kauai. 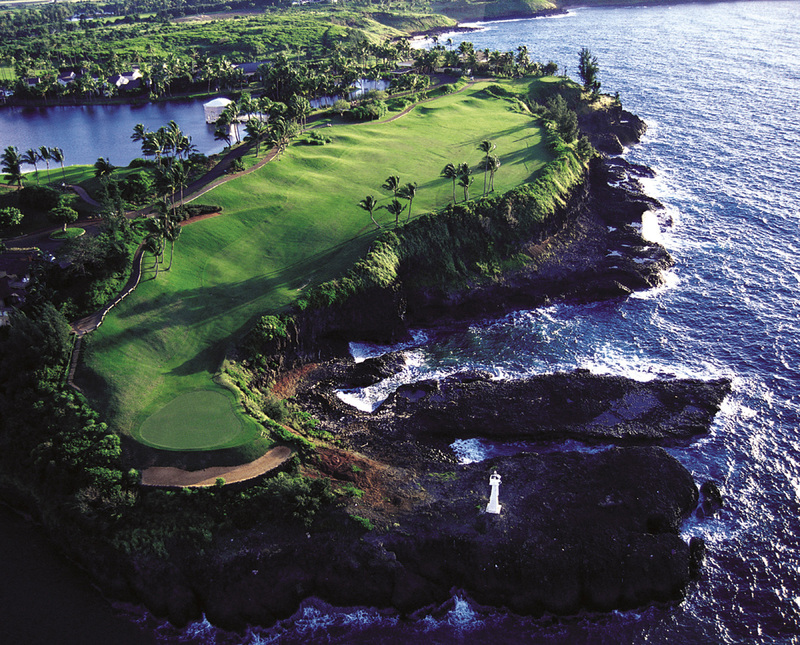 More than likely, the place golfers dream about every night is Kauai. Sure, some might toss and turn under the covers as they take on St Andrews’s treacherous Road Hole in a 40mph wind, or ‘see’ themselves waiting for kangaroos to clear the fairway at Royal Melbourne, but really the place that evokes the most soothing pictures, and therefore the most relaxing sleep, is the oldest and fourth largest island of the Hawaiian archipelago. Often called the Garden Isle on account of its being rather pretty, Kauai sits in the blue Pacific, 80 miles east of Oahu. It was formed six million years ago, give or take, by a couple of volcanoes; Kawaikini at 5,243 feet and 5,148ft Mt. Waialeale, the east side of which endures 460 inches of rainfall a year on average – about 13 times what we get in Bellingham! This rather damp spot is the result of an angry little micro-climate that fortunately doesn’t affect any of the island’s eight wonderful golf courses, the most acclaimed of which is surely the intimidating Prince Course at the newly opened St. Regis Princeville Resort (that is to say the resort, which has been here since 1985, recently underwent a considerable makeover by Starwood and re-opened in October last year as one of just 18 St. Regis properties around the world). The resort, of which Miami Herald columnist Dave Barry once said ‘this is where people in Heaven want to go when they die’, is located on the island’s north coast overlooking gorgeous Hanalei Bay which might just be the most beautiful place in all of Hawaii. Opened in 1990, the Prince Course is invariably ranked the top layout in the Aloha State and came in at #67 in Golf Digest’s most recent ranking of the nation’s best. It was designed by Robert Trent Jones Jr. who also built the Makai Course at Princeville, as well as Kiahuna and Poipu Bay at the other end of the island. Named for Prince Albert, son of Hawaii's King Kamehameha IV and Queen Emma, the Prince is 7,309 yards long from the back tees which you’re best advised not to play. Ironically, the course is the total antithesis of what you might expect a resort golf course to look like; even if you made the fairways 10 yards wider, thinned out the rough and the surrounding jungle, and stuck every pin in the middle of the green, this would still be too difficult for most amateur golfers. The slope says 140 which makes you wonder how on Earth it could find an extra 15 points to take it up to the USGA maximum of 155. But while the Prince definitely doesn’t suit the inexperienced dabbler out for a casual round, it will provide ample drama, excitement and challenge for the competent player. It starts with a magnificent downhill Par 4 that won’t scare the scratch man (what hole does? ), but probably will put the fear of God in any man whose handicap is north of 15. The scale of the hole is rather daunting for the first-time visitor, its look unlike anything you’ll have seen here in the Northwest. This behemoth course may not be to everyone’s taste, but there’s no denying a number of similarly thrilling holes follow, all of which add up to what the marketers are fond of calling, a unique and memorable experience. 18 of the 27 holes on Princeville’s original course, the Makai built in 1971, recently benefitted from a multi-million Dollar overhaul that saw salt-water tolerant Seashore Paspalum replace the existing Bermuda turf, the course lengthened, new bunkers added and existing ones reshaped, and improvements to the practice area. Actually the 27 holes have been split into the 18-hole Makai Course which can stretch to 7,223 yards but won’t challenge or stimulate the golfer to quite the same degree as the Prince, and the nine-hole Woods Course which is ideal for families and resort golfers who fancy a quick stroll after a busy day spent snorkeling, kayaking, hiking, horse-back riding or just hanging out at the 5,000sqft infinity pool located a few yards from the white-sand beach and which, it has to be said, is surely one of the finest places in the world at which to hang out. Staying at the St Regis and playing the two Princeville courses is not an inexpensive treat but definitely worth whatever effort you make, and however long it takes, to save up the necessary funds. Once there, you’ll probably be tempted to stay put for the duration of your stay on Kauai, but it would be a shame to come all this way and miss out on the island’s other courses none of which can match the Prince Course for sheer entertainment value but which certainly have their share of compelling moments nevertheless. Take the second shot on the 16th hole at the Jack Nicklaus-designed Kauai Lagoons for example. A short, narrow Par 4 with Nawiliwili Harbor in the background and the ocean all the way down the left side, this is one of those easy birdie/easier triple-bogey holes that you think about long before you get there. Adjacent to the splendid Kauai Marriott Resort & Beach Club, which completed a $50 million renovation last December, and just a stone’s throw from the airport at Lihue, Kauai Lagoons began life as a 36-hole facility but is currently undergoing a major renovation that will eventually see the course trimmed to three nines – virtually all of the existing Kiele Course with another ocean hole designed by the Golden Bear, and nine from the Mokihana Course. For now though, only 18 are available for play - 12 from the old Kiele, including a couple of jungle-carry Par 3s and that captivating 16th hole, plus six from the Mokihana. 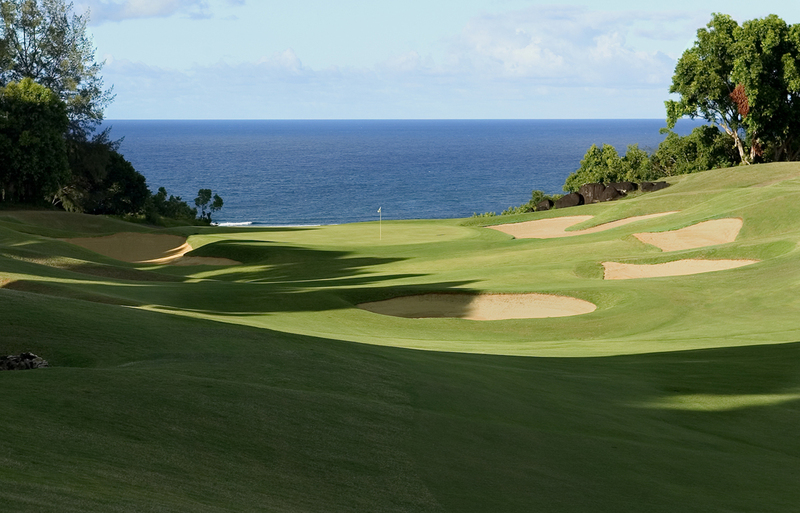 There are one or two significant trips between holes, but the course is still pure Kauai. Construction on the new course has halted temporarily, but once complete the Kiele will feature the longest stretch of ocean holes in Hawaii. Also in Lihue is the excellent Puakea GC which consisted of just ten holes for its first 12 years. Designer Robin Nelson only had time to build those first ten before Hurricane Iniki wreaked her havoc on the island in 1992. A recession followed and the course stood idle until 1997 when it opened as a ten-holer which Sports Illustrated rated as one of the best nine-hole courses in the country! AOL Founder Steve Case then purchased the property and re-hired Nelson to finish the job; all 18 holes eventually opening in July 2003. Those expecting the sensational views you tend to get at every other hole in Hawaii will have to get past the 1st which plays toward the Kukui Grove Shopping Center, but once they do they will not be disappointed. There may not be any ocean holes at Puakea (the odd view now and again), but many of the jungle scenes from Jurassic Park were filmed around here, so you know the Home Depot which seriously impairs the look of the opening hole is just an aberration. And though it doesn’t boast as many picture postcard vistas as the Prince Course say (though the downhill Par 3 6th is pretty special), it could be argued Puakea has a greater number of sound, well-designed holes than any other course on the island. He’s biased, of course, but when Nelson says Puakea may be the most fun course to play in the whole of Hawaii, he just might be right. Just a little north of town up the Kuhio Highway is the Kauai County-owned Wailua GC which gets everyone’s vote for best value on the island, especially from local residents who can play the Toyo Shirai-designed course, which was extended from nine to 18 holes in 1961, for a barely plausible $15. Non-residents pay $60 which, for a Hawaiian course that has hosted three US Amateur Public Links Championships, is still pretty special. On an island where golf doesn’t come cheap, no one would blame you for setting up shop for a week at Wailua. Nor could anyone question you for favoring the south end of the island, Poipu specifically. Here, next to the Grand Hyatt Kauai Resort and Spa (which brings the number of ludicrously opulent and lavish hotels on this small island in the middle of a vast ocean to three - St Regis, Marriott, Grand Hyatt) you find Poipu Bay which hosted the PGA Grand Slam of Golf from 1994 to 2006. Another Trent Jones Jr. creation, Poipu Bay enjoys the best location of any Kauai course with ocean and mountains framing its 7,123 yards. The best holes come late in the round; the 16th an enormous Par 4 on top of the cliffs overlooking the bay, the 17th a beautiful downwind Par 3, and the excellent Par 5 18th where Phil Mickelson missed a nine-foot putt for eagle and a round of 58 at the Grand Slam of Golf in 2004. Poipu Bay will close on April 1st for the rest of the year as it transitions to Seashore Paspalum. The Grand Hyatt will also begin a major refit about that time but will remain open as the work will be completed wing by wing. Trent Jones Jr’s fourth Kauai course is Kiahuna, a mile from the Grand Hyatt and another lovely 18 holes. It opened in 1984, seven years before Poipu Bay, and eights years before Iniki came blasting through causing the layout to fall into a state of disrepair. It lost so much of its original luster, Jones wanted to disassociate himself from the course and its Japanese owners were happy to accept an offer from local homeowners who set about on a $4million restoration. The biggest change was swapping the existing Bermuda turf for Seashore Paspalum (Kiahuna was actually the first course on the island to make the switch) which not only saved the superintendent roughly half a million gallons of water a year but also made the playing surfaces firmer and faster. With such an enjoyable course to play and ancient remnants of an authentic Hawaiian village, a long-abandoned Portuguese dwelling, and a cave that's home to the Koloa Blind Wolf Cave Spider to see, Kiahuna could be the Kauai round you remember most fondly. Or not, the competition is pretty stiff. 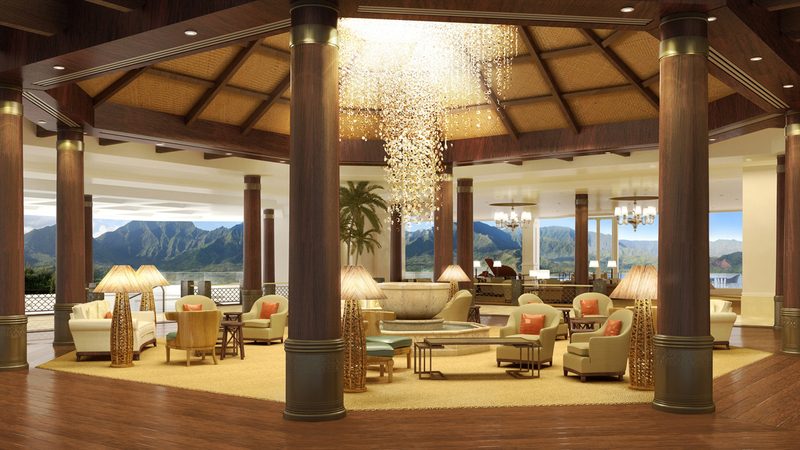 The current changes comprise the first of a three-stage renovation going on at the Kauai Marriott Resort, last year named in America's top 50 by Golf Magazine. Three new holes are being built, including a new ocean hole, while six of the existing holes on Kiele's back nine are being improved with new greens, bunkers and drainage. Phase 1 should be complete by May 2011. Roy Yamaguchi's The Tavern at Princeville will open later this month and offer relaxed, casual dining in a room overlooking the Prince Course. Puakea's 'Kids Play Free' campaign was originally scheduled just for the summer months, but will now extend to the end of the year. Kids aged 7-17 can play the Robin Nelson-designed course for free with a paying adult. 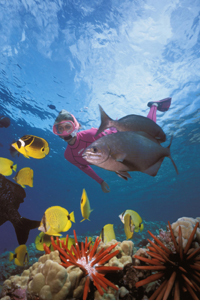 When to go: There is no bad time to go to Kauai, but why not avoid fall or winter in Bellingham? Green Fees: Range from $125 to $200 plus (apart from Wailua. Some courses have free golf for juniors with a paying adult in the afternoons). Getting There: Connect in Seattle. Alaska Airlines flies direct from Seattle to Lihue; or find a cheaper flight (much cheaper) via Honolulu on Alaskan or Hawaiian. Getting Around: Rental cars are available at Lihue Airport (LIH), or Kauai Island Tours (800-733-4777) rents vans and drivers allowing you to sit back and enjoy the view. For the Non-Golfer: Snorkeling, hiking, horseback riding, surfing, helicopter tours, spa treatments, waterfalls, volcanoes (in other words; they won’t be short of things to do and see).